Union County, NJ – The Union County Board of Chosen Freeholders encourages all residents to recycle clean, white, block-style Styrofoam at designated drop-off locations in their municipality, or at a countywide location in Springfield. As part of the effort to encourage Styrofoam recycling, the Freeholder Board has provided nine Union County municipalities with signage, educational brochures and new recycling bins. Berkeley Heights, Cranford, New Providence, Plainfield, Scotch Plains, Springfield, Summit, Union Township and Westfield have all received the new materials. “The Styrofoam recycling programs enable Union County residents to help increase our efforts to conserve resources and manage our waste stream more efficiently. It is a good opportunity for all of us to ‘think globally, act locally,’” said Freeholder Chair Bette Jane Kowalski. Styrofoam is the common name for polystyrene, which comes under the Plastic #6 recycling category. Residents who use the drop-off locations can help ensure that the program is successful by following the recycling rules. All Styrofoam dropped off for recycling must be clean, dry, and in block form, such as that used for furniture and appliance packaging. Residents can look for the #6 recycling label to confirm it is acceptable for recycling. The unacceptable list includes all food service items, packing peanuts, egg cartons, and any colored, wet, or dirty foam. All Union County residents and businesses are welcome to bring clean, dry, block-form Styrofoam for recycling to Foam Pack Industries, located off Route 22 East at 72 Fadem Road in Springfield. The recycling bin is in the company’s parking lot and is accessible at any time. Berkeley Heights: Berkeley Heights DPW yard, 101 Berkeley Avenue, on the first Saturday of the month from 9:00 a.m. to noon. Cranford: Cranford Conservation Center, 210 Birchwood Avenue, on Wednesdays from 9:30 a.m. to 3:20 p.m., and on Saturday and Sunday from 9:30 a.m. to 3:50 p.m.
New Providence: New Providence DPW, 29 Park Place, on the first and third Saturday of each month from 9:00 a.m. to 1:00 p.m.
Plainfield: PMUA Transfer Station, 95 Rock Avenue, Monday through Friday from 7:00 a.m. to 3:00 p.m., and on Saturdays from 8:00 a.m. to 2:00 p.m.
Scotch Plains: Scotch Plains DPW, 2445 Plainfield Avenue, on Thursdays between 8:00 a.m. and 2:30 p.m.
Springfield: Springfield Municipal Pool parking lot, 40-44 Morrison Road, first Saturday of every month from 7:00 a.m. to 11:00 am. Summit: Transfer station, 40 New Providence Avenue, Tuesday through Friday from 7:30 a.m. to 3:45 p.m. and Saturday from 7:30 a.m. to 4:45 p.m.
Union: Union DPW, 1 Swanstrom Place, Monday through Friday from 8:30 a.m. to 4:00 p.m.
Westfield: Westfield Conservation Center, 1300 Lamberts Mill Road. Styrofoam may be dropped off whenever the facility is open (visit westfieldnj.gov for days and hours of operation). The Styrofoam recycling program is part of Freeholder Chair Kowalski’s environmental initiatives for 2019. Other recycling initiatives this year include a new interactive display at the Trailside Nature and Science Center, new educational programs focusing on senior centers, continued promotion of “Recycle Right!” compliance guidelines, and the new “Reel In and Recycle” anti-litter campaign for Union County Parks. For more information about Styrofoam recycling visit ucnj.org/recycling/styrofoam. For all other Union County recycling programs call the Union County Recycling Office at 908-654-9890 or visit online at ucnj.org/recycle. 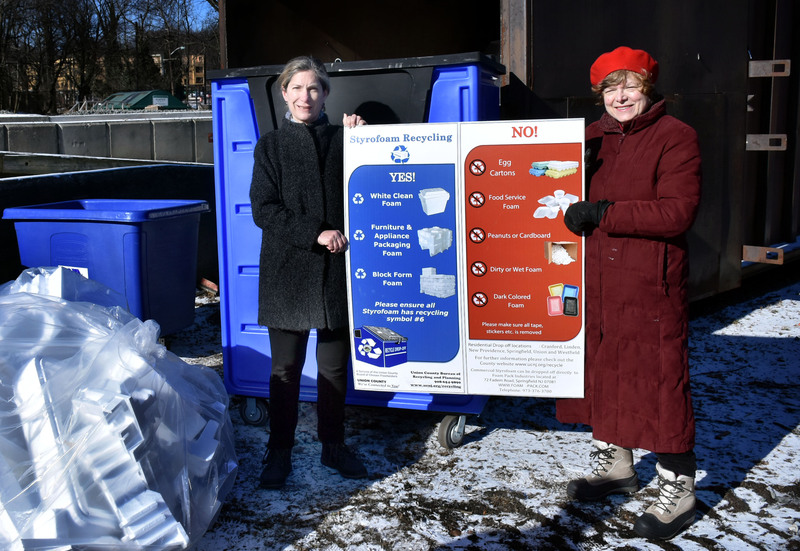 Photo caption: Union County Freeholder Chair Bette Jane Kowalski (right) and Cranford Deputy Mayor Ann Dooley visit the Styrofoam drop-off site at the Cranford Conservation Center on Birchwood Avenue to raise awareness about Styrofoam recycling. To assist in the recycling effort, the Freeholder Board has provided new signage and recycling bins for Cranford and eight other municipalities in Union County. All Union County residents can drop off clean, white, block-style foam for recycling at designated locations in their municipality or at a countywide site located in Springfield. For complete details visit ucnj.org/recycling. Credit: Jim Lowney/County of Union.